Many people believe that the most important characteristics of a diamond are the four Cs: color, carat weight, clarity, and cut. True savvy shoppers, however, recognize that inferior diamonds can have poor proportions or inadequate angles that detract from the stone's beauty and lower its value no matter how it measures up to the four Cs. By being familiar with the anatomy of a diamond and how it affects quality, you can buy far better than an average quality stone. The most basic way to polish a gemstone, whether it is a diamond, aquamarine, peridot, or other crystal is to tumble it - rounding and polishing the stone while leaving the general rough shape intact. By using abrasives and water to naturally cure the stone, tumbling simulates the natural process that forms smooth pebbles in rivers and streams. Stones finished in this fashion are called "baroque," meaning "irregular," and are often used for unique jewelry such as pendants and brooches. The majority of gemstones, however, are meticulously cut and polished with exacting angles, proportions, and dimensions. The anatomy of a diamond or other gemstone is made up of these precise cuts, and the stone's quality depends on accuracy with each cut. Different diamond shapes have slightly different requirements for ideal proportions based on how light is reflected within the stone to maximize its brilliance. By understanding basic definitions, however, you can demonstrate to your jeweler that you are more than a casual observer or impulse buyer, and they will be more willing to explain the intricate details of each stone you examine. The table, or top of the diamond, is the largest facet on the stone. On a round stone, it will be octagonal, and it should be perfectly centered. The table size will vary depending on the shape and color of the stone in order to provide the most sparkle with reflected light. The stone's crown is the narrow upper area, above the girdle. In many settings, this part of the stone will be above the prongs or metal holding the stone in place, and it will be most visible. Because of this, it is the most prone to scratches. The girdle is a narrow band, parallel to the stone's table, and is the widest part of the gem. Girdle thickness is critical to the diamond's strength and must be sufficient to prevent accidental chips and cracks. 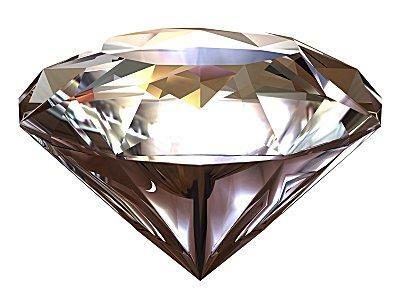 At the same time, a girdle that is too thick will add worthless carat weight to the stone and increase the price tag, even though the stone's brilliance will be diminished. By being familiar with the anatomy of a diamond, you can avoid this type of poor cut and unnecessary expense. The stone's pavilion is the area below the girdle that typically comprises the longest part of the stone except for emerald or other rectangular shapes. In many settings, the pavilion is obscured, but the prong or tiffany setting reveals the pavilion and increases the diamond's brilliance by allowing light to enter at different parts of the stone. 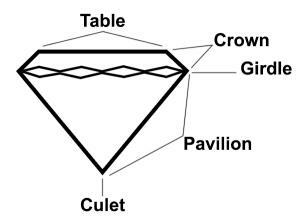 The culet is the tiny facet at the bottom of the pavilion, parallel to the table, and is often used to even out the facets of the diamond and give it a more symmetrical appearance. Ideally, a stone will have no culet, but that perfection is rarely achieved. A large culet will often appear as a dark spot or hole through the stone when viewed through the table. The stone's facets are the smooth, polished planes that make up its surface. In a typical round shape, there are 58 facets, though fancy shapes and signature cuts often have a greater number. The fewer facets a stone has, the less reflection and brilliance it will exhibit, though a totally smooth stone without facets has its own unique appeal. By understanding the anatomy of a diamond, you can assure that any stone you purchase is of exceptional quality and avoid common cutting flaws, such as a thicker girdle. Another consideration is the angle of the girdle between the crown and the pavilion: this affects the reflection and appearance of the stone. Every stone shape and cut requires different proportions for the best appearance: if you have already decided on a shape before shopping for your engagement ring, be sure to investigate the specific dimensions that are ideal for that shape. By being an educated shopper, you can easily purchase a quality stone that will not only wow your fiancée, but will be a brilliant investment for many years.